Jennifer Chiaverini at December book-signing. December is National Read a New Book Month, and there’s still plenty of month left if you haven’t started yet. We’d like to suggest the latest from Jennifer Chiaverini. The Enchantress of Numbers is the story of Ada Byron Lovelace, the inventor of computer programming. 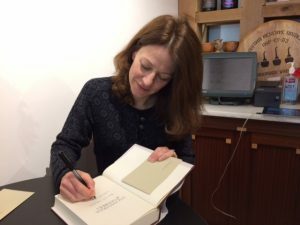 At a recent sold-out book signing event sponsored by Gramercy Books in Bexley, Jennifer answered questions and read from The Enchantress of Numbers, written as a first-person memoir of an unsung heroine of the modern era. While many in the computer world know about Ada, explained Jennifer, most people have never heard of her. Born into wealth, privilege, and celebrity as the only legitimate child of nineteenth century super-star poet George Gordon, Lord Byron, Ada seemed to have it all. But despite the advantages, she was no more in control of her life than any other woman. And Ada, a mathematical prodigy, dearly wanted to make a contribution to the world. Jennifer’s novel is written from the point of view of Ada, from her earliest memories of childhood to the always-looming shadow of the father with whom she never had any relationship. Ada’s mother, a wealthy woman with connections that extended to the royal family’s inner circle, believed in equality for women and directed her daughter’s rigorous education. However, Ada was never allowed the opportunity to exercise her imagination. It was believed that the “mad, bad, and dangerous to know” Byron had bequeathed to his daughter an equally dangerous tendency towards mental instability and against this specter, the young woman’s mother was always on guard. At least Ada married someone who believed in her intellectual abilities, and she was able to work with the inventor of the Analytical Engine and the Difference Engine, Charles Babbage. The forerunners of the modern computer would change the world, of course, but it took Ada to create the means by which that would happen. We hope you will consider this compelling and highly-readable book — and that you will participate in this reader-friendly way to celebrate the season!